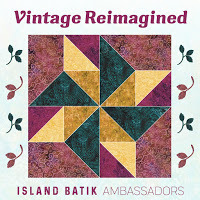 Vintage Reimagined is the theme for the March Island Batik Ambassador Challenge. 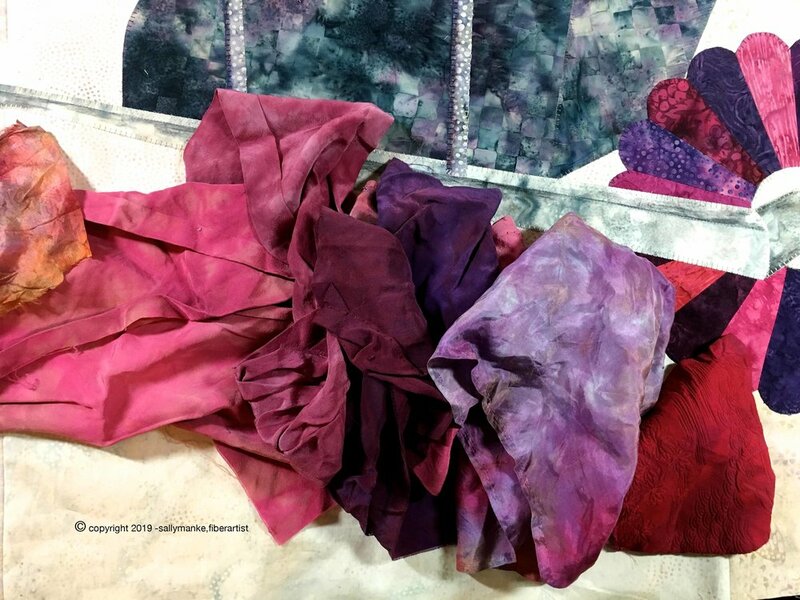 Using fabric provided by Island Batik, each ambassador created a quilt at least 36” X 36” using any technique. 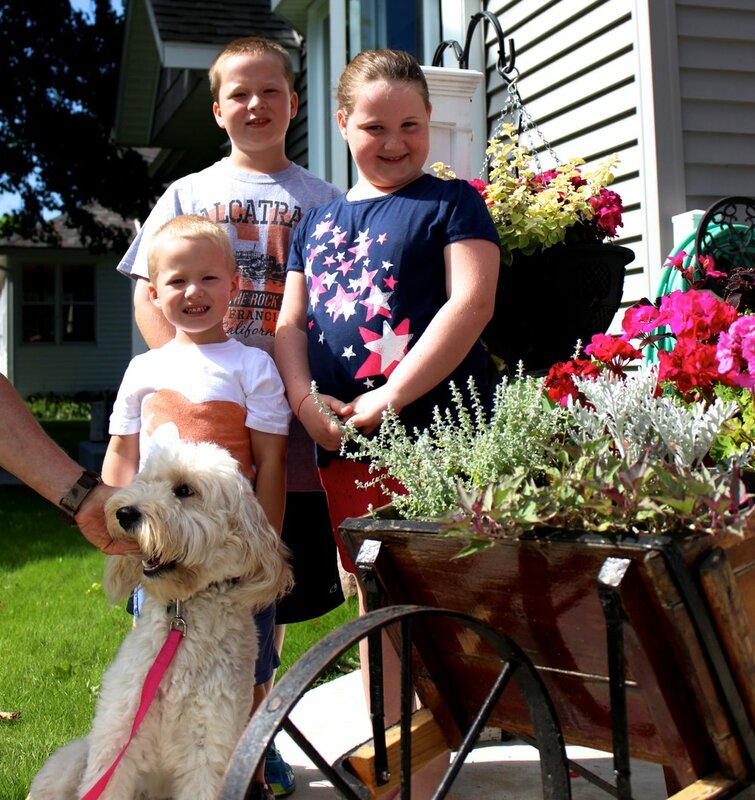 Each summer as our time together in Michigan ends, a photo of the Virginia grandkids is snapped in front of my vintage wheelbarrow. This is usually in late July or early August after the flowers have almost taken it over. 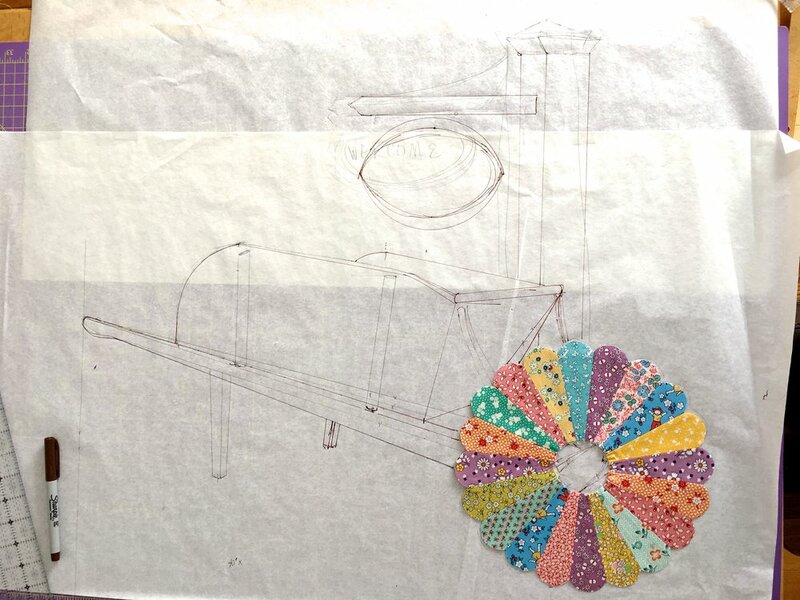 What better project for a vintage challenge than a vintage block like a Dresden reimagined into a vintage wheel? 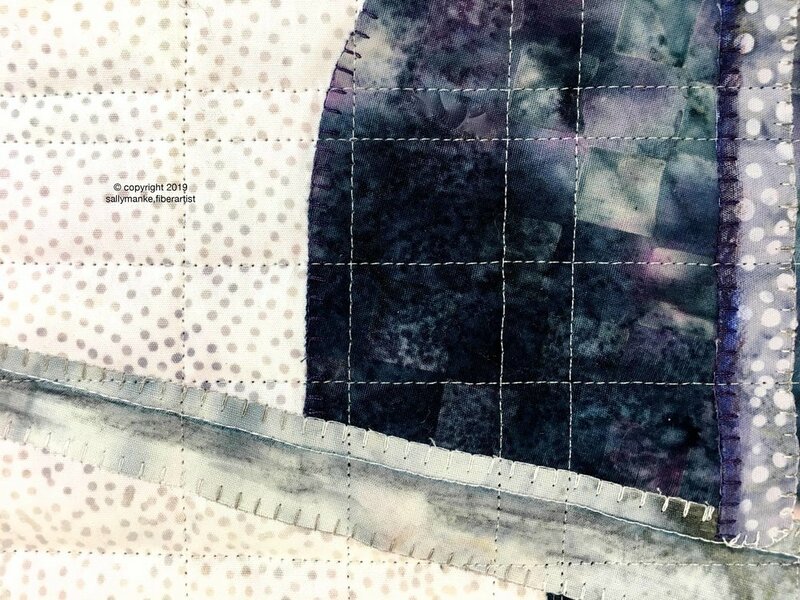 Using an orphan block to suggest proportion, quilt pattern is first drawn on plain white paper. 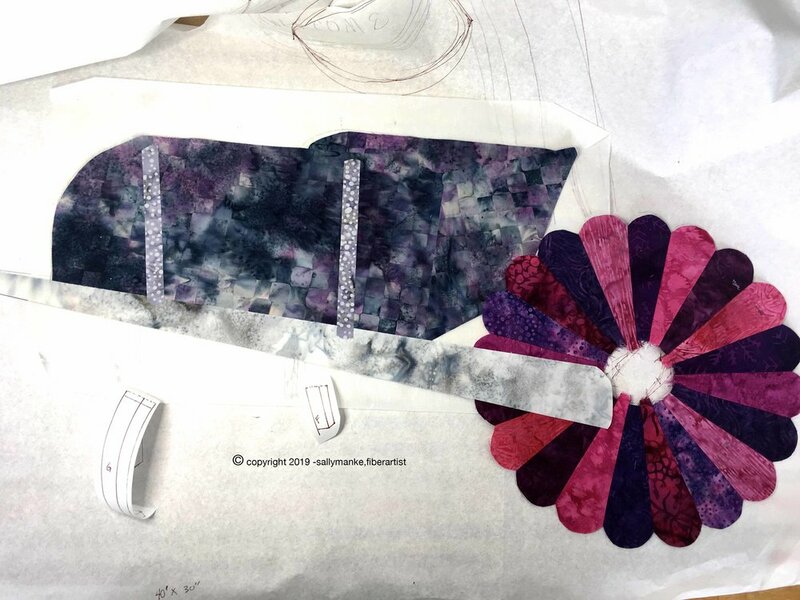 Pattern pieces are then accurately transferred to freezer paper on Cutterpillar Glow. 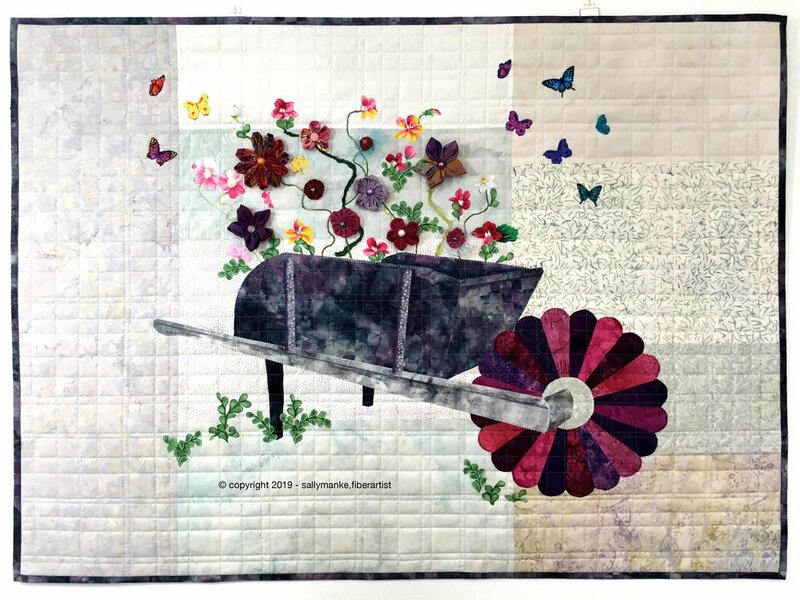 Possible fabric choices are selected for the background, wheelbarrow and wheel. 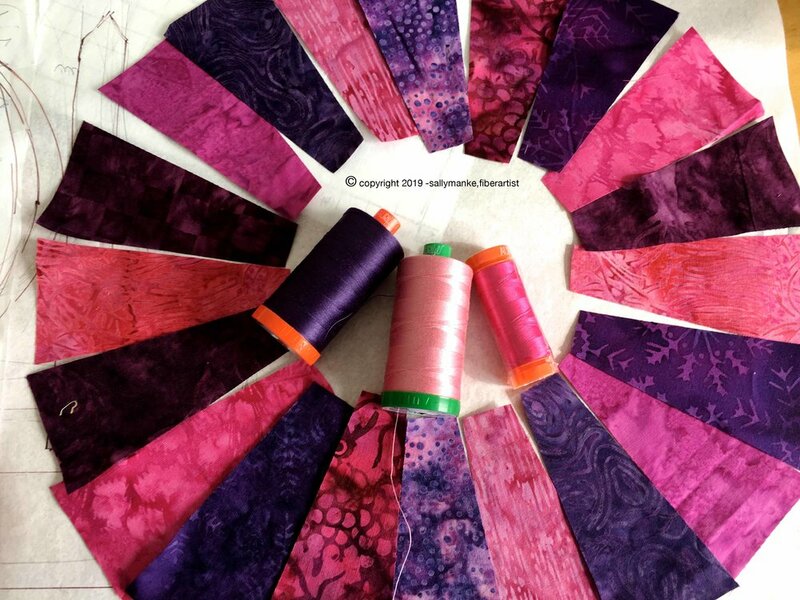 Wheel wedges are cut and arranged before stitching with Aurifil Thread. 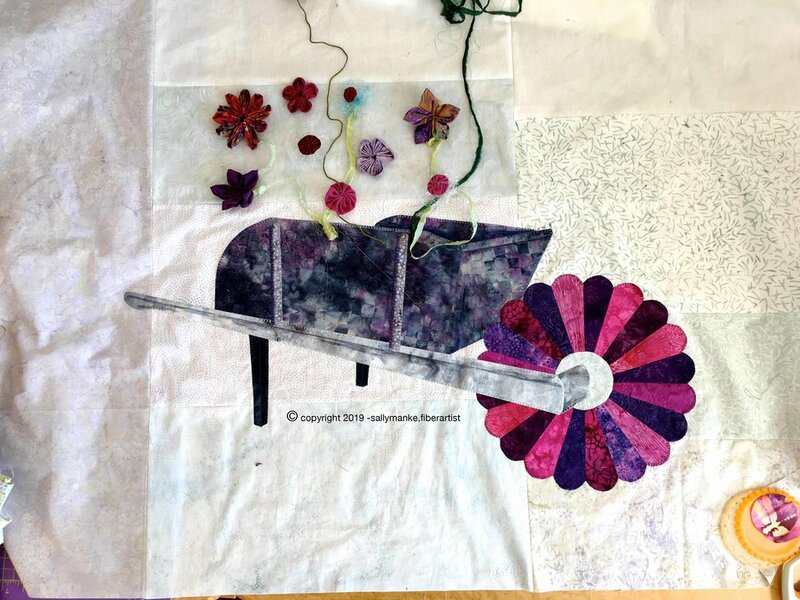 Wheelbarrow parts are cut from Misty Fuse back batiks then assembled on backing fabric. Shading details are added with Inktense Pencils and Liquitex Fabric Medium. 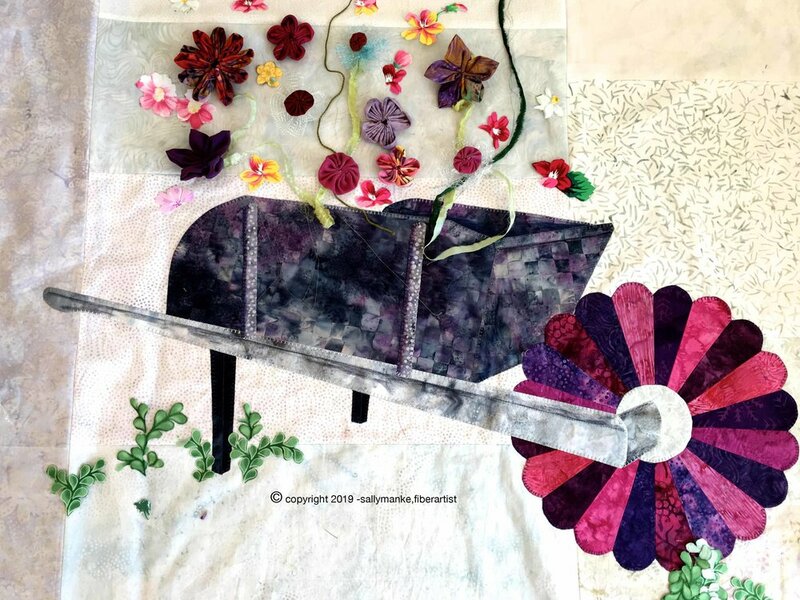 Each part of the wheelbarrow is then machine blanket stitched to secure. This reinforces the Misty Fuse bonding. 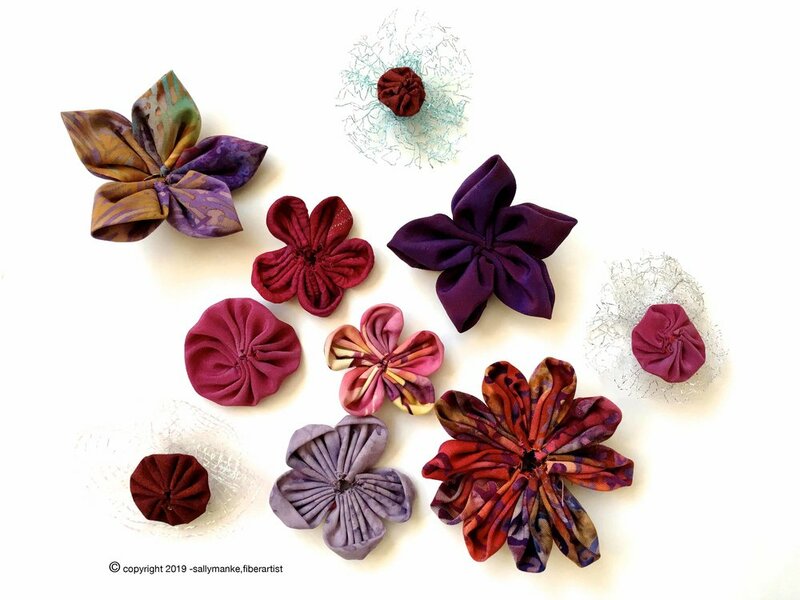 Island Batik cotton and rayon fabrics along with silk hand dyed pieces are selected for 3-D flowers. 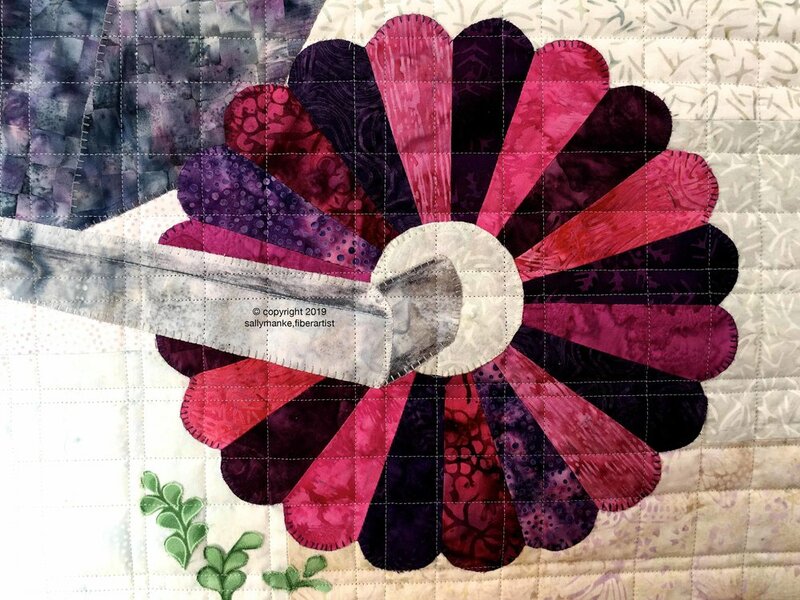 Clover flower makers are used to create a variety of blooms that will be added after quilting. 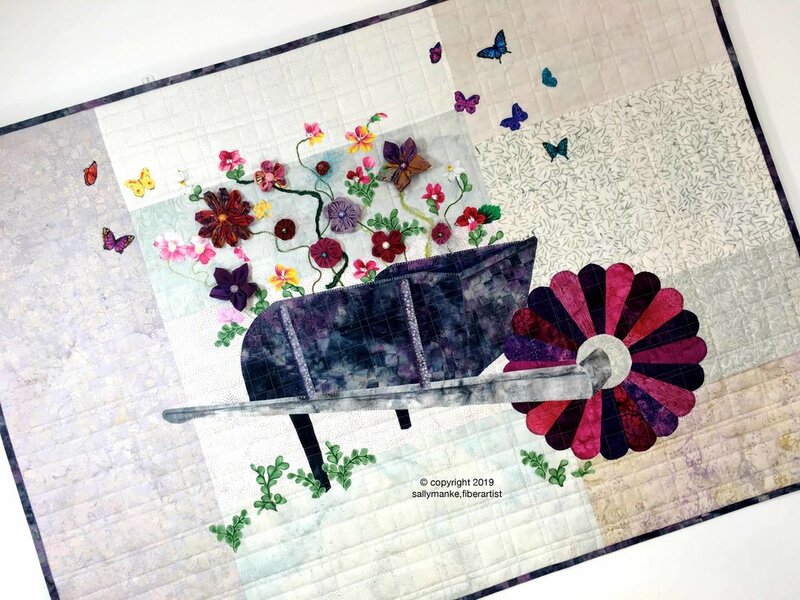 It’s off to the Handi Quilter Avante for vertical and horizontal straight line quilting. 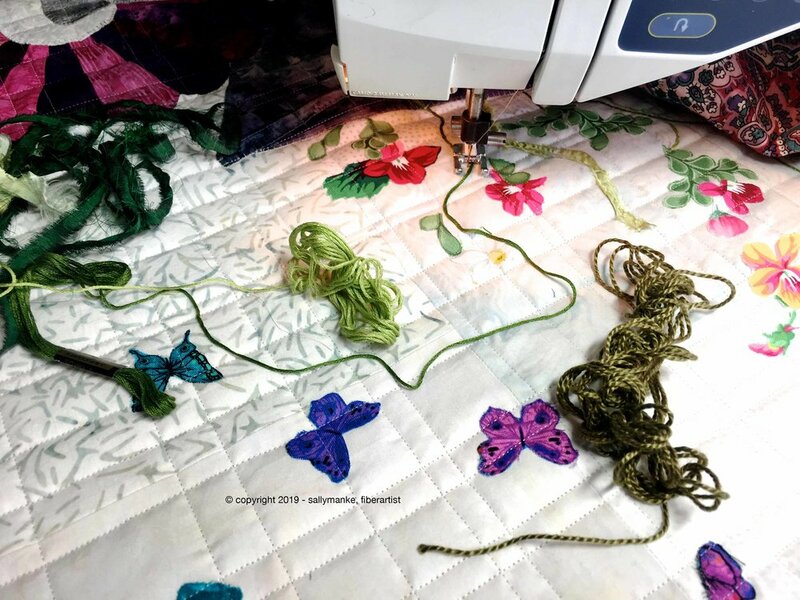 A variety of novelty yarns, floss and sari silk strips are couched to create stems and vines. 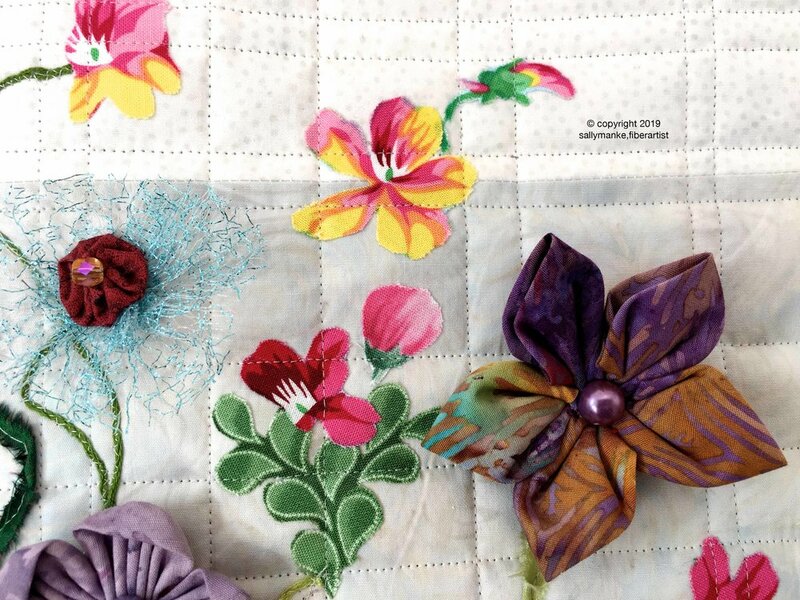 Flowers are attached with beads and buttons to add and accent in the center of each. 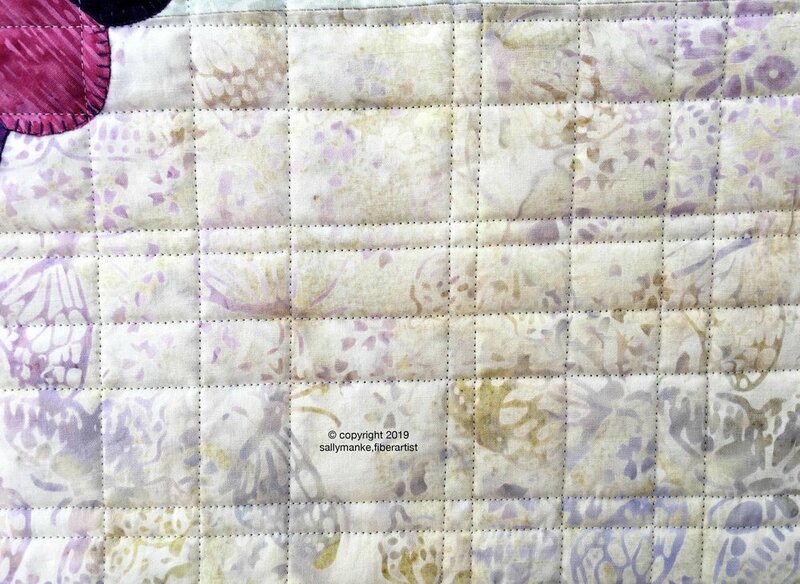 Here’s another view of the finished quilt after binding and hanging sleeve are attached. 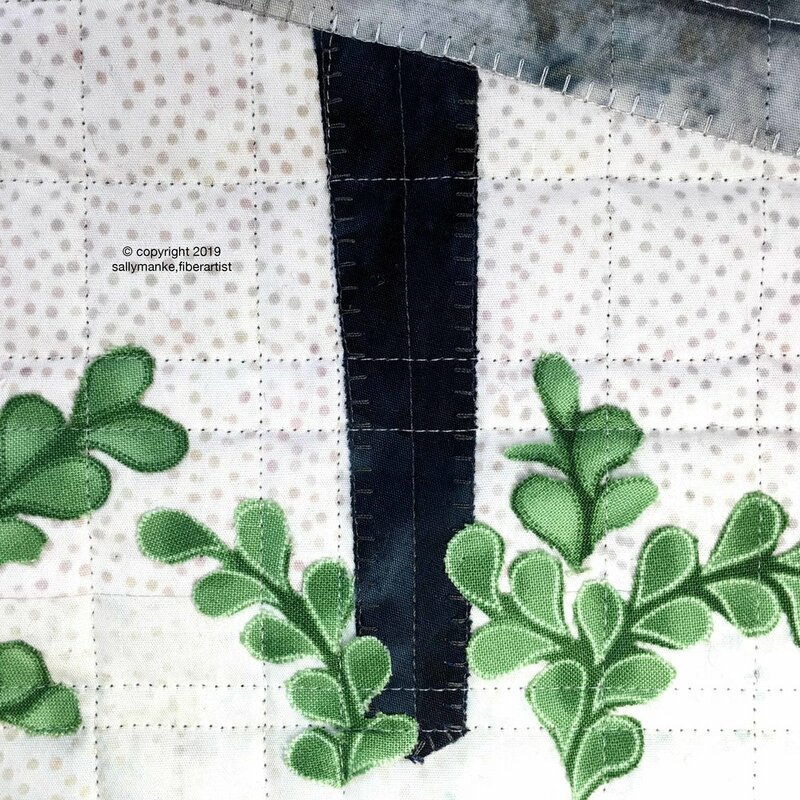 Hobbs 80/20 batting was used in this quilt. This finished at 30” X 41”. And a few close ups of the finished work.